"Those who fire missiles at Israel are supported by Iran with weapons, money and training,” he said. Just as Iran threatens us, so too it threatens the United States." The delegation from the House of Representatives was headed by Majority Leader Eric Cantor and Policy Committee Chairman Tom Price. 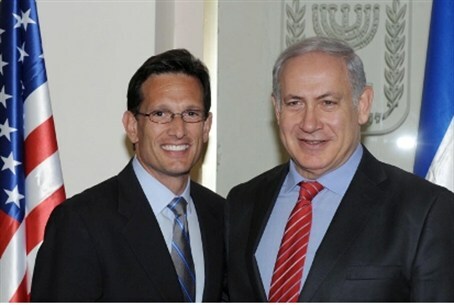 The timing of the visits by the GOP contingent and an even larger number of Democratic legislators could not have been better for the Netanyahu government. Last week’s terrorist attacks north Eilat and the ensuing missile attacks on southern Israel highlighted for the Congressmen the dangers of an independent Palestinian Authority. The United Nations next month is scheduled to debate an Arab League proposal, in the name of PA Chairman Mahmoud Abbas, to recognize the PA as a country, based on Abba’s territorial demands. The terrorist attacks brought out strong support from U.S. politicians, including those who are not on the current junket. New Jersey Democratic Rep. Congressman Steve Rothman, a member of the House Appropriations Subcommittees on Defense, State and Foreign Operations, issued a statement saying, “The terrorist attacks by the Sinai border highlight the importance of ensuring that the borders between Israel, Egypt, and Gaza are fully monitored and secured. Illinois Republican Rep. Robert Dold said that the attacks “lay bare the tragic reality that our ally Israel is surrounded by hostile neighbors who continue to target Israel’s innocent men, women, and children for murder. “The strategic relationship that the United States and Israel share is very much a two-way street, which is often overlooked,” he said. “Many think it’s just the United States providing aid to Israel when in actuality the Israelis are providing intelligence and sharing best practices. Many leading Senators and Congressmen have proposed that American funding for the Palestinian Authority should be halted if it goes through with idea of appealing to the United Nations to circumvent Israel and ask for recognition.